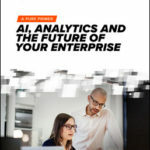 In this special guest feature, Michael Hiskey, CMO of Semarchy, discusses how in the age of big data and IoT, the well-known, but often misunderstood, area of Master Data Management (MDM) is the essential tool for bringing meaning and insight to troves of raw data. Michael led marketing for data wrangling start-up Trifacta. Prior to this, he led marketing for the analytics portfolio at MicroStrategy. Michael joined MicroStrategy from a CMO role at Kognitio, the VP of Marketing & Business Development where he had worldwide responsibility for marketing and strategic partnering relationships. By all projections, big data and the IoT (Internet of Things) are poised for huge growth in the coming years. Ericsson’s latest Mobility Report forecasts that by 2022 there will be 1.5 billion devices with cellular connections, up from 400 million at the end of last year. Consumer “things,” such as home automation devices and smartwatches, will comprise a large part of that. In the near future, it’s likely that commercial “things,” such as transportation and power generation components, will see greater investment and focus. Either way, businesses will be the main beneficiaries — the data they collect will be limitless — but how will they cross the gulf between having more data and having more information? How will they successfully turn the issues of more data into new opportunities? In the age of big data and IoT, the well-known, but often misunderstood, area of Master Data Management (MDM) is the essential tool for bringing meaning and insight to troves of raw data. As IoT devices stream unprecedented volumes of data, the ability to intelligently master this data and give context to the web of complex relationships associated with it, grows more important. For instance, real-time telemetry on delivery trucks in transit is hardly useful if that data can’t be connected to the customer’s order; knowing whether a specific delivery arrives on time or is delayed, is a simple but essential link that can prevent service issues or order cancellations. Another problem businesses encounter with massive data influxes is that data often does more harm than good. Data can become inconsistent as it grows, wreaking havoc on a business. Businesses that struggle to maintain a complete view of customer, product, and supplier data can experience decreases in customer satisfaction, miss cross-sell and up-sell opportunities, and become ensnared in potential legal problems. For instance, when the General Data Protection Regulation is applied in the EU next year, companies will become responsible for deleting their clients’ data — which means they must have a clear picture of the data in the first place. If it seems like common data entry errors — accidental misspellings of names, incomplete addresses, mis-entered phone numbers — have hamstrung systems only in years’ past, consider that just this month Amazon Web Services went down due to a typo during a routine maintenance. This affected file-sharing and data loading of thousands of companies, and while the true effect remains unknown, it begs questions like: what happens if data from a medical device is associated with the wrong patient? When imagining this scenario multiplied across all domains with greater proliferation of big data and IoT, it is easy to see why Forbes estimates that poor customer satisfaction costs companies $62 billion per year. These issues illustrate why intelligent MDM will become a major asset in the age of IoT. Conventional MDM systems are purpose-built for single domains, like customer or product. By relying on rigid model structures and development processes rooted in decades-old data management solutions, they now find themselves unsuited to the task of understanding the complex, interconnected relationships in the mature “big data” that streams out of internet-connected devices. Today’s MDM solutions use smart algorithms and rules-based automation to empower users with all levels of technical savvy. Sleek and agile, they enable flexible interpretation of multiple data domains simultaneously, and can be built up in an iterative fashion over time, as data grows and relationships change within a data set. These systems interoperate with all kinds of legacy systems, inheriting and learning from relationships between data, entities and event across domains. As IoT grows, the need for intelligent MDM solutions will grow in parallel. Watch this space.